Barbara Crandell is paying tribute to her fellow Native Americans who served in the United States Armed Forces. "I just wanted to honor my brothers and sisters. I wanted to honor all the people in West Virginia," Crandell said. At 87-years-old, she is still sharp as a tack. Over the past ten months, she made it her mission to put a memorial at the West Virginia National Cemetery in Grafton. At Saturday’s unveiling, she placed the flags for her family members, including her husband, who served in the military. "Our family fought under the flag of the people who took our land but we still live here and we had a certain amount of freedom. not as much as we would have liked to have," Crandell said. Mark Routier calls Crandell 'grandmother'. He helped her in her efforts with the memorial and said it is important to keep the history of Native Americans alive. "It’s all about recognition and the heritage that I and so many people are very proud of," Routier said. The memorial now stands near the Blue Star Memorial in the cemetery. He says he hopes it is a reminder of what Native Americans gave to their country. 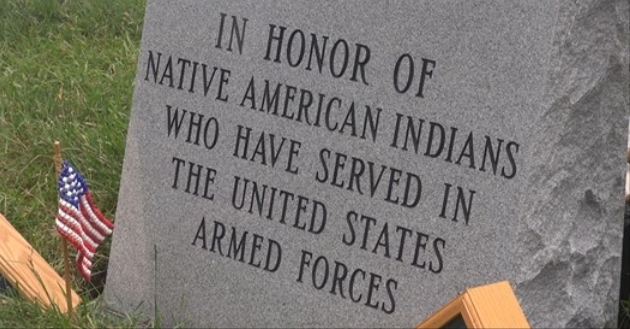 "It’s just a very rewarding experience to be part of this placement honoring of the stone honoring our Native Americans who served in the United States Armed Forces. It’s very, very important," Routier said. Responses to "New memorial honors Native Americans who served in military"
I understand that Indians serve in the armed forces at one of the highest rates of any US demographic.